Only 600 coins were minted before the design was changed to show a swimmer’s face. The swimmer's face is now visible in the 2nd image. The regular version is not so rare and can be seen at auction with starting bids from £1.00 because it is not so rare. 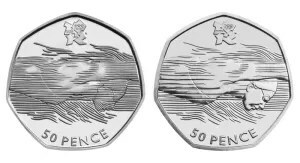 In conclusion, make sure you understand the difference in these coins before consider rare Olympic Aquatics 50p listings are "rare". Finally, check the condition of the coins you buy because this has a huge affect on value. One of the rare versions of this coin sold on eBay (28/11/2016) attracting 67 bids and with a final selling price of £820! Due to the high prices of the rare coin, FAKE copies have appeared on eBay. Check the listing details for the word COPY. It is unclear from the ebay listing if the seller knew why his auction was getting so much attention as the description made no mention of this coin be included in a set of 7 others stating only "RARE Set Of 7 Olympic 50p Coins Circulated VGC Low Starting Bid". The fact it was bundled in with other much less valuable coins makes us think the seller did not know what they had. We would have expected this extremely coin to fetch more money and perhaps it would if the seller had listed it by itself and put a more prominent description. It would have even been worth advertising it outside of ebay. Previously one sold in October 2016 for £910 Super rare,2011/2012 London Olympics,aquatics swimming 50p coin,1st run after the previous owner kept it carefully in a safe knowing its high value. How to spot the rare Olympic swimming coin? Reminder of the rare swimmer coin vs the common one, left is the rare one where the swimmers face is covered in flowing water. Right is the common one where the swimmer's face is clearly visible. Check ebay for current Aquatics 50p coins for sale below. Can you spot a rare one before anyone else does? No items matching the keyword phrase "Olympics Aquatics 50p -details -kew -team -all -various -2016 -copy" were found. This could be due to the keyword phrase used, or could mean your server is unable to communicate with Ebays RSS2 Server.